Uncommon map showing Jefferson's proposed states and the first map to name Michigan as a body of land. Etats-Unis De L'Amerique Septentrionale Avec Les Isles Royale, De Terre Neuve, De St. Jean, L'Acadie. 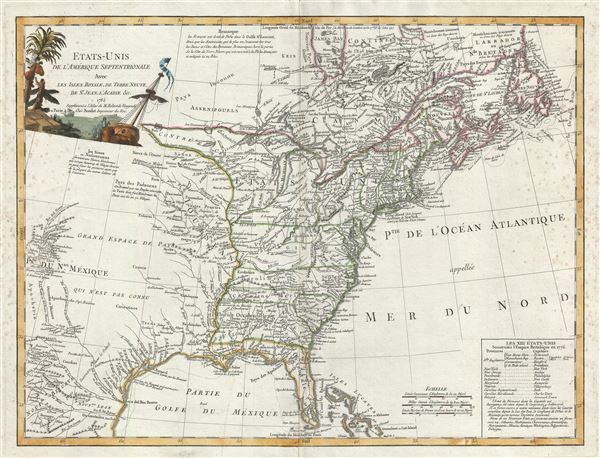 An uncommon and important first edition first state 1785 Antoine Boudet map of the fledgling United States shortly after the end of the American Revolutionary War. This map is important as one of the first, if not the first, to describe the 1784 Jeffersonian Ordinance, in doing so the first to apply the term Michigan to a land area, and for its detailed illustration of the new international borders ratified under the 1783 Treaty of Paris. Geographically the map covers from James Bay and Labrador to Florida and the Bahamas, as well as from the Rio de Norte (Rio Grande) to the Atlantic seaboard and Newfoundland. This map's most historically significant feature is its inclusion of a table lower right quadrant detailing the proposed states of the Jeffersonian Ordinance of 1784 - the first map to do so. Boudet, possibly working through Delamarche, a known correspondent of Jefferson, must have attained this information well in advance of competing cartographers and considered it something of a coup. The Ordinance of 1784 was a recommended plan for dealing with the new territory officially accorded to the United States by the 1783 Treaty of Paris, which formally ended the American Revolutionary War. The treaty ceded to the United States all former British territory east of the Mississippi and south of the Great Lakes. Jefferson proposed, rather than follow old colonial boundaries, that all territory west of Appalachian Mountains be federally administered, surveyed, and broken up into various states - for which he seems to have provided a list of rather arbitrary names. The intent of the Ordinance was to lay the groundwork for settlement and eventual statehood. The list of suggested Jeffersonian territories, appearing on the lower right, included Silvania, Michigania, Chersenosus, Arsenistpia, Metropotamia, Illinoia, Saratoga, Washington, Polypotamia, and Pelisypia. Few of these names survived but Michigania, Washington, Illianoia stand out as exceptions. Although the term 'Illinois' was already in common usage, this is very notably first cartographic use 'Michigan' in reference to a land area. Washington would not emerge as a new territory until much later and far beyond the United States as anticipated by Jefferson. Ultimately the Jefferson Ordinance was only partially adopted, but it influenced the Northwest Ordinance of 1787 and, by calling for a uniform township survey, fostered the creation of the General Land Office Survey. This map is also significant in its illustration of the new boundaries accorded to the freshly minted United States under the 1783 Treaty of Paris. Here the United States is outlined in green, British territories appear in red, and Spanish lands in yellow. The United States extends westward to the Mississippi, beyond which Louisiana has been granted to Spain. So too has Florida and the French colonial seat of New Orleans. The British have retained Canada, with the northern border extending through the Lake of the Woods (L. des Bois), Lake Superior, Lake Huron, and Lake Erie, and Lake Ontario - much as it remains to this day. There is some confusion regarding the Maine / Sagadahoc border where Sagadahoc (Sagadahok) is granted to the United States but Maine given to Canada. Since both Maine and Sagadahok were administered by the Massachusetts Bay colony, as noted in the table, this cartographic oddity remains a mystery. Nearly 1/3rd of the map is given to the Spanish territories between the Mississippi and the Rio Grande. As the map notes, this a Grand Espace de Pays Qui N'est Pas Connu (Great Tract of Country which is not known). Nonetheless, several tribes are noted, including the Sioux, Apache, and Padouca, among others. In modern day Texas, here identified as Tecas, the old Spanish missions along the Rio de Norte (Rio Grande), including Santa Fe, are noted. One might wonder why a map intent on illustrating the United States would include these vast Spanish territories. Most likely this is a response to Boudet catering to his French clientele who would have retained a significant interest in those former French Territories, including Quebec and Louisiana, lost during the French and Indian War. This map was attached to the 1785 edition of Robert de Vaugondy's Atlas Universal, but it does not appear in the index, suggesting it may be an independent issue that was acquired separately and tipped in by the atlas owner. We are aware of two states of this map which are generally similar with the exception of the imprint, one of which attributes the map to Boudet, and the other which attributes it to Delamarche. We may surmise that the map itself, in both states, is the work of Charles Delamarche, who worked with Vaugondy and Boudet. This edition, which is inscribed to Boudet and quite rare, is most likely the first state issued just before Vaugondy's death. This would account for the Boudet imprint, as he was Vaugondy's partner. However, we know that Boudet was not an engraver or cartographer himself, but rather a businessman and financial partner in the Vaugondy firm. Boudet no doubt recognized the potential commercial value of a new United States map and ordered Delmarche to produce it. The other far more common variant with the Delamarche imprint, but the same 1785 date, appears in 1786, and is most likely a hasty revision following Delamarche's acquisition of the Vaugondy plates. And in fact, a close examination of the imprint on Delamarche issue gives evidence that an earlier imprint has been scratched out - further suggesting that the present Boudet variant example is in fact the first state. Not in Pedley. Antoine Boudet (c. 1715 - 1787) was a shrewd business man and map publisher active in Paris, France during the latter part of the 18th century. Boudet was the stepson of Jean Baptiste Coignard, a royally appointed Parisian printer. In 1751 Boudet acquired roughly half of the Coignard firm and, on his own account, acquired a considerable fortune publishing the innovative periodical Petites Affiches. Boudet must have seen potential in that map and atlas market early on. Around 1746 - 1746 Boudet contracted the firm of Dheulland and Vallet to engrave large format forgeries of earlier maps by Guillaume Delisle and Jacques Nicholas Bellin - even going so far as hiring Bellin himself to update and revise the forgeries. This plan was stymied by a law suit brought against Boudet by Philippe Buache, who claimed the copyrights to Delisle's work. He later entered into a business arrangement with the prominent and well respected Parisian cartographer Gilles Robert de Vaugondy and financed several of Vaugondy's atlses, including the Atlas Portatif and the Atlas Universel. It was Boudet's keen business sense that made the production of the expensive and lavish Atlas Universel possible. He adopted a subscription system which partially paid for the atlas prior to the work's formal production. Boudet was later sued for non-payment by the engravers of the Atlas Universal, the Dalahaye firm. Moreover, Boudet's long lasting feud with Buache came back to haunt him when Buache, now an important and influential member of the Academie des Sciences, brutally and unnecessarily criticized the work. Boudet maintained offices on the Rue St. Jacques, Paris. Robert de Vaugondy, G., Atlas Universel (Paris: Delamarche) 1786. The Atlas Universel was the crowning glory of the Robert de Vaugondy firm's atlas production. The atlas was revolutionary on many levels and exemplified the Vaugondy creedo commode, complet, univorme, et suive (convenient, complete, uniform, and easy to use). The atlas thus consisted of a wide corpus of maps, both modern and historical, was of moderate height and width, and featured maps of uniform style and structure. They partnered with Antoine Boudet, a shrewd businessman and publisher with whom they had worked previously, to produce the first edition. To minimize his fiscal risk, Boudet sold the atlas first by subscription using a large prospectus, receiving in the process over 1100 pre-orders. The first edition appeared in 1757 and contained beautifully produced maps with elaborate freshly designed allegorical cartouche work, generally by Pierre-Edme Babel, Pierre Philippe Choffard, and Charles Nicholas Cochin. Most of the maps were engraved by the Delahaye firm, the payment for whose services ultimately led to legal disputes. Despite proving a popular work of astounding quality, the Atlas Universal received harsh criticism from fellow cartographers, particularly Philipppe Buache. Ever at odds with the Vaugondys, Buache's critical perspective may have been influenced more by political maneuvering than academic affront. The atlas was issued in multiple editions between 1757 and 1788. Later editions, issued after 1786, were taken over by Charles Delamarche, who inherited the Robert de Vaugondy firm and assumed Boudet's publication rights. Very good. Some very minor discolorations along original centerfold. Minor repair split bottom margin. Else very clean. Karpinski, L. C., Bibliography of the Printed Maps of Michigan, 1804-1880, #CIII. Sellers, John R. and Van Ee, Patricia, Maps and Charts of North America, no. 187. Mapforum, Early Maps of the United States, 67. McCorkle, B. B, New England in Early Printed Maps 1513 - 1800, 785.5. Pedley, M. A., Bel et Utile: The Work of the Robert de Vaugondy Family of Mapmakers, p. 227.